Helfrich: We find these ideas in many different cultures. It’s not just one or the other. Things are not separate, but interrelated. Therefore, Javier Medina, a Bolivian philosopher who is one of the most literate interpreters of the idea of Buen Vivir, says it is a display of intelligence that “we Bolivians want to have the State and also want to have the ayllu, though they are two antagonistic magnitudes….” And he continues: “Our problem is that in not picking up on the civilizing nature of both, we confuse them, provoking the inefficiency of both.… At this point…, let’s not have any more real State: follow the liberal Third World simulation, nor more real Ayllus: in their place, docile social movements.”5 In your opinion, does the ayllu persist in contemporary Bolivia? Do they have like a “physical-social embodiment”? Helfrich: Your description of the ayllu is reminiscent of the concept of commoning, which is discussed so much in this book and which expresses much better than the term commons where the heartbeat of the debate lies. Both el Buen Vivir and commoning can only be thought of in their specific social context and as a social process. Indeed, it seems to me that both are more systems of production in community and at the same time they produce community. Helfrich: In essence, what’s the difference between the Andean conception of el Buen Vivir and Western thinking? It is not a “betrayal” by the Morales administration but the expression of a historic mentality. Let me try to explain: The “revolution of 1952”11 promoted the transformation of the indígenas into campesinos, through mixing, the use of Spanish, individual land ownership and the market, and the state-peasantry pact (1952–1974). That process had advocated modernization and national development by diversifying production and the industrialized exploitation of the natural resources in the hands of the state. The failure of that nationalist process led to the modernist neoliberal period, which was defeated by the popular insurgency of 2003. Nonetheless, in the last five years, the increase in international raw materials prices has given new life to the illusion of development based on the old nationalist extractivism. 1. Boaventura da Souza Santos. “Diversidades y cambios civilizatorios: ¿la utopía del siglo XXI?” FEDAEPS, FSM Belem. 2009. 2. Editors’ note: “21st century socialism” is a political expression that gained currency ten years ago, particularly in the context of the World Social Forum. It is also frequently used in Venezuela by the administration of President Hugo Chavez. 3. Álvaro García L., Interview with Miguel Lora, www.bolpress.com, May 10, 2009. 4. See Vinod Raina’s essay criticizing the concept of “development” in Part 2. 6. See Gerhard Dilger’s essay on the Belo Monte mining operation in Part 2. 7. On the consequences of mining in Latin America, see also the essay by César Padilla in Part 2. 8. Editors’ note: The eighth Indigenous March was brutally broken up by the Bolivian police. This led to the immediate resignation of the Secretary of Defense and huge social protests and criticism of Evo Morales. Several days later, construction of the road through the TIPNIS region was stopped. 9. See Gustavo Esteva’s essay in Part 2 and Nikos A. Salingaros and Federico Mena-Quintero’s essay in Part 5. 10. 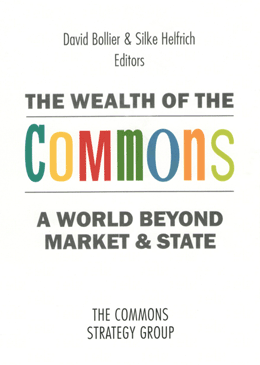 See Ugo Mattei’s essay on a “phenomenology of the commons” in Part 1. Gustavo Soto Santiesteban (Bolivia) is a writer, semiotician and consultant on issues of indigenous rights. He is researcher at the Center of Applied Studies of Economic, Social and Cultural Rights (Centro de Estudios Aplicados a los Derechos Económicos, Sociales y Culturales). He is a lecturer of semiotics, philosophy of language and epistemology at different Bolivian universities.